Hers was a tragic tale... A genteel woman with an empty purse, a baby to raise and a husband in old England's debtor prison. 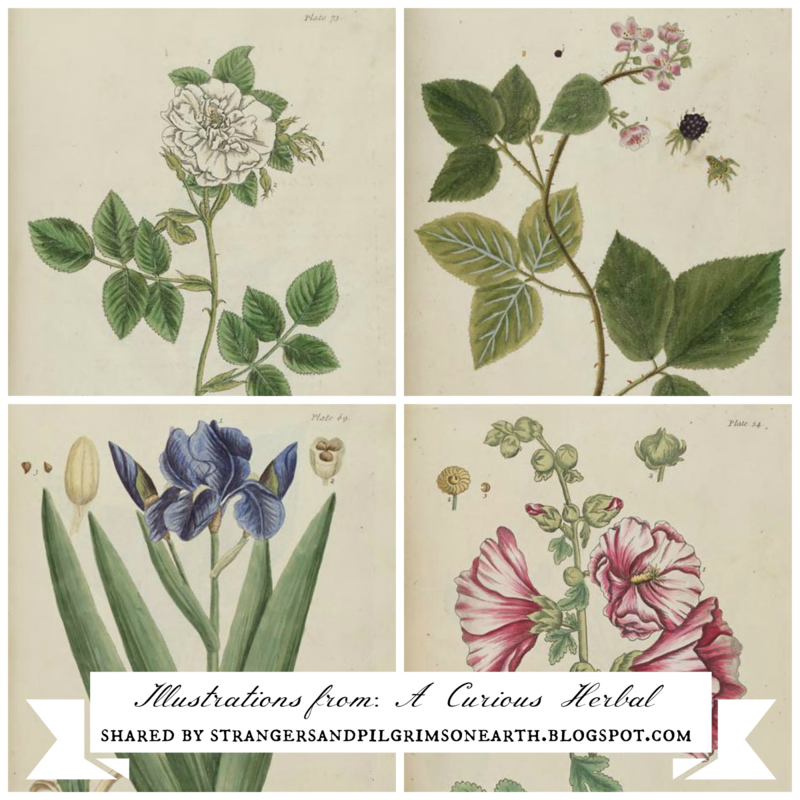 "A Curious Herbal" had a curious beginning indeed. One of the first herbals published by an English woman, Elizabeth Blackwell (not to be confused with the first woman doctor) created it in order to collect enough funds to free her husband from debtor's prison in the early 1700's. Alexander Blackwell was a lavish spender and reckless businessman. He was described as being a "...self-styled Dr. [and] handsome rascal…" by Emily Read Cheston in an article printed in the Herbarist in 1942. 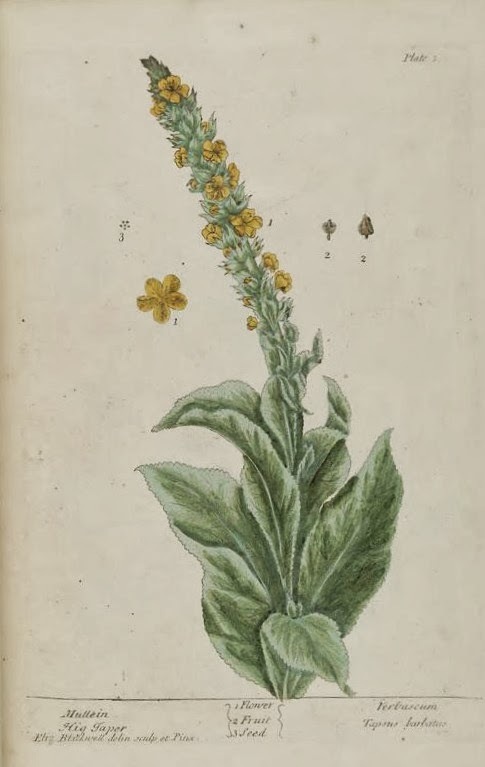 With only her artistic skills to recommend herself and her husband's medical background, she sought to publish an herbal which would introduce plants from the New World (a much needed reference at the time). Taking lodging by a nearby botanical garden, she had access to species which where represented from all over the world, including the new varieties from the Americas. Her plan was to illustrate them and consult her husband (in prison) for their characteristics and medicinal value. He would also give the proper Latin, Greek, Dutch, Italian, Spanish and German names for each plant. She undertook this project with zero background in botany. "BLACKWELL, ELIZABETH (fl. 1737), wife of Alexander Blackwell [q. v.], is positively asserted by James Bruce (Lives of Eminent Men of Aberdeen, p. 307) to have been the daughter of a stocking merchant in Aberdeen, and to have eloped with her husband to London before he found employment as a corrector of the press. No authority is given for these statements. 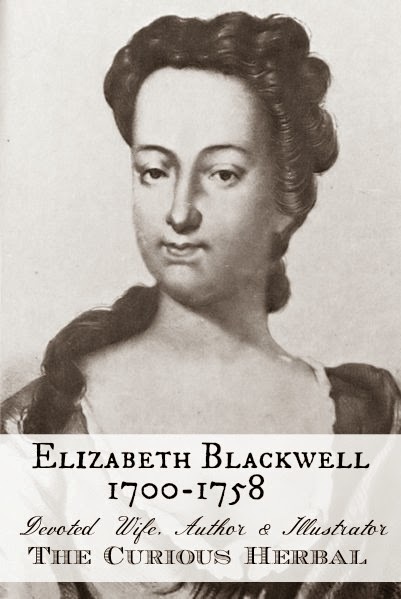 Blackwell's biographer in the 'Bath Journal,' who seems to write with a knowledge of the family, asserts on the other hand that the marriage took place subsequently, and describes Elizabeth as ' a virtuous gentlewoman, the daughter of a worthy merchant,' who gave his daughter a handsome portion. ' 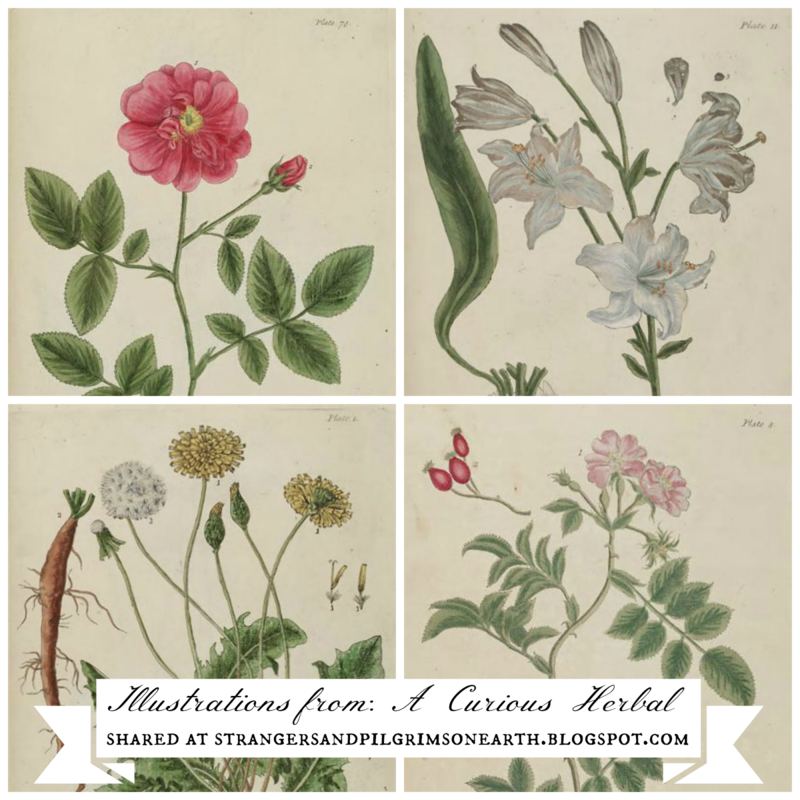 Virtuous ' and ' worthy ' were unquestionably epithets applicable to Elizabeth herself, who extricated her husband from his pecuniary difficulties by applying her talent for painting to the delineation of medicinal plants with the colours of nature." She would eventually draw, engrave and color over 500 illustrations in a two year span. In 1739, two volumes were printed which was quite an accomplishment. As it turned out, "A Curious Herbal" was somewhat successful and Elizabeth was able to use the funds to free her husband. 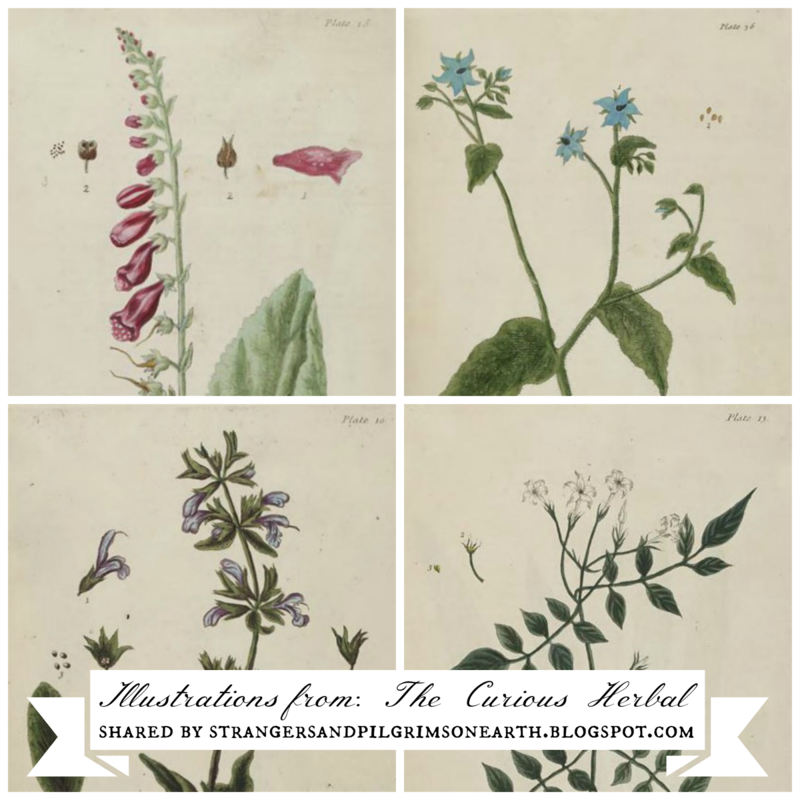 Her work was republished many times over the next two centuries and was used as a viable resource for apothecaries and physicians of the time. Unfortunately, her beloved did not reform his ways and thus this tale has a tragic ending. "he was tried and sentenced to be decapitated. He remained in good spirits to the last - at the block, having laid his head wrong, he remarked that since it was his first beheading, he lacked experience and needed instruction. On 9 August 1747 he was executed as Elizabeth was leaving London to join him." She was a determined woman who remained loyal to her husband all the days of her life, sharing her royalties with him until the bitter end. 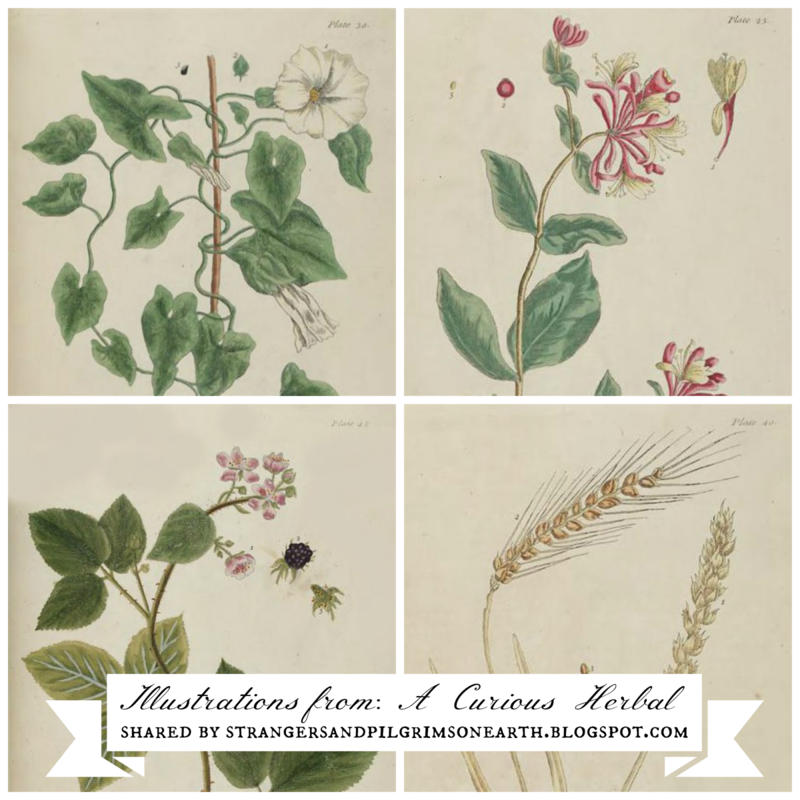 Link to Elizabeth Blackwell's "A Curious Herbal"
Here is the link to the original volume which showcases her beautiful illustrations and herbal information. You may get inspired to create something similar for the plants found in your back yard once spring makes her entrance! Her pictures would be helpful for identification. And though her story was sorrowful, you may also be inspired by the devotion found in this resourceful woman of yesteryear. Herbal Note: You will notice that each plant presented in an authentic herbal (see insert above from "A Curious Herbal") features information about its characteristics such as height, color of leaves and flowers, where it is found and during which time of year. It also shares the medicinal purpose of the plant and potential forms of preparation such as syrups, simple waters and tinctures, to name a few. 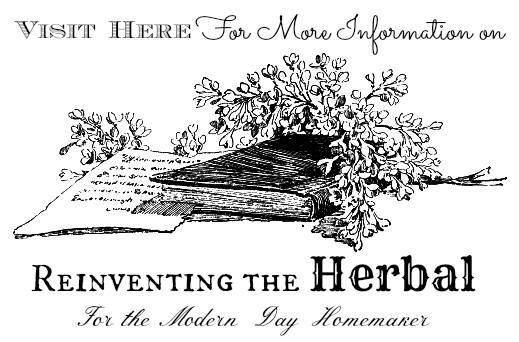 To make your own modern day herbal, visit here. This post may be shared with some or all of the following link-ups: Modest Mom Monday's, Homestead Barn Hop, Teach Me Tuesday, Raising Homemakers, Make Bake Create, Wise Woman Link Up, Christian Homemaking, Welcome Home Wednesday, Wildcrafting Wednesday, Frugal Days, Sustainable Ways, Homemaking Wednesdays, Homemaking Thursdays, From the Farm Blog Hop, Farmgirl Friday, and Clever Chicks Blog Hop. Thank you lovely ladies for hosting these. Information for this article was gleaned from the following web-sources: source one, source two and source three. Another season of citrus is coming to a close and so will this series. We leave you with one last idea, simply display the fruit itself until ready to use. Oranges with leaves and blossoms attached spreads cheer during a cold winter day. Place them in wicker or wire baskets, display them in stoneware or vintage bowls and in cake-stands or other tiered decorations. This post may be shared with some or all of the following link-ups: Modest Mom Monday's, Homestead Barn Hop, Teach Me Tuesday, Raising Homemakers, Make Bake Create, Wise Woman Link Up, Christian Homemaking, Wildcrafting Wednesday, Wow Us Wednesdays, Welcome Home Wednesdays, Frugal Days, Sustainable Ways, Homemaking Wednesdays, Homemaking Thursdays, From the Farm Blog Hop, Farmgirl Friday and Clever Chicks Blog Hop. Thank you lovely ladies for hosting these. 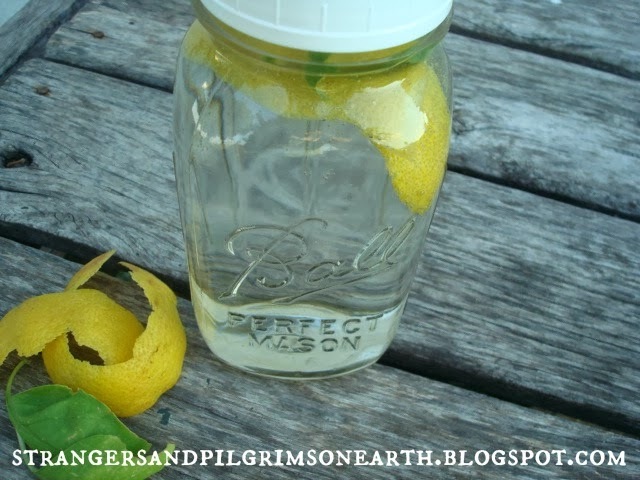 "Anne had brought glasses and lemonade for her guests, but for her own part drank cold brook water from a cup fashioned out of birch bark… Anne thought it more appropriate to the occasion than lemonade." 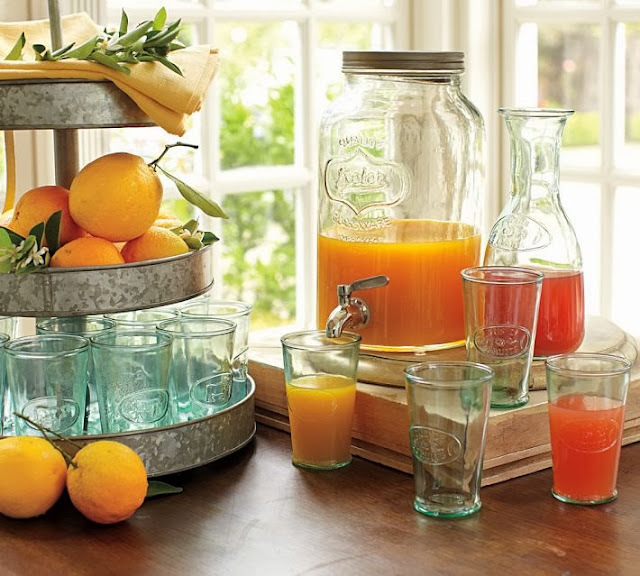 We like to make batches of frozen "Minute-Maid-Like" lemonade concentrate while the citrus fruits are in season. This is something you can preserve now to bless your family with in the summer. 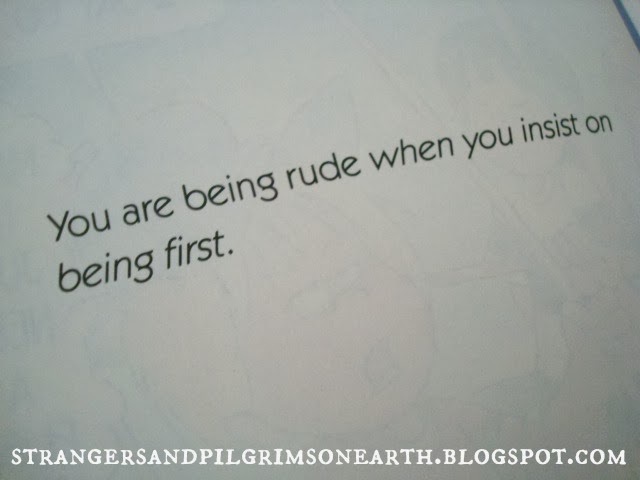 Usually, it is the other way around! 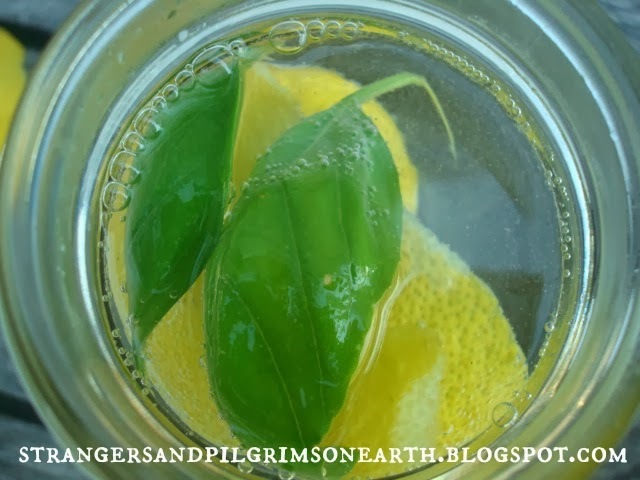 And the best part is that our recipe is simple to prepare and healthy too since lemon juice is full of vitamin C, potassium, folic acid, phosphorus and antioxidants (benefits of raw honey are shared here). Stir the following ingredients together (it is fine if it doesn't mix together perfectly due to thicker honey), place in small plastic containers, label and freeze for the future. 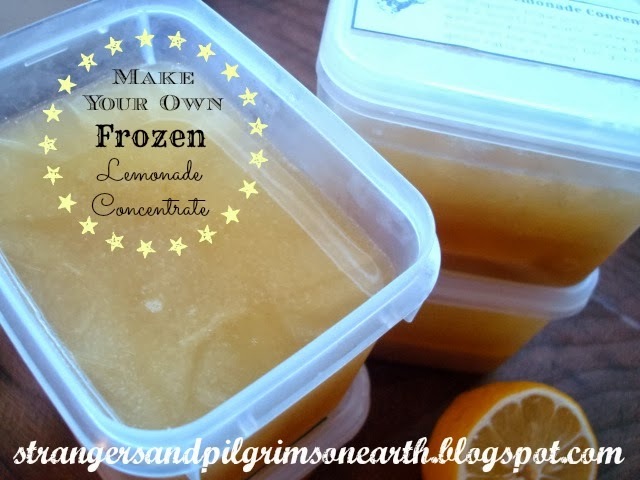 To prepare, add 2 quarts of water (room temperature is fine) and one container of your lemonade concentrate (frozen concentrate will release easier from container if you run tap water on its underside for a few minutes) to a large pitcher. Stir contents until dissolved. We like to place 4 cubes of ice in each 16 oz. glass for a good ratio of flavor when serving. I paste labels on my frozen concentrates so that I can identify them and the directions are right there when I need to prepare them. Simply download and print the sheet from the link below if you are interested. This post may be shared with some or all of the following link-ups: Modest Mom Monday's, Homestead Barn Hop, Teach Me Tuesday, Raising Homemakers, Make Bake Create, Wise Woman Link Up, Christian Homemaking, Welcome Home Wednesday, Wildcrafting Wednesday, Frugal Days, Sustainable Ways, Homemaking Wednesdays, Homemaking Thursdays, From the Farm Blog Hop, Farmgirl Friday, and Clever Chicks Blog Hop. Thank you lovely ladies for hosting these. 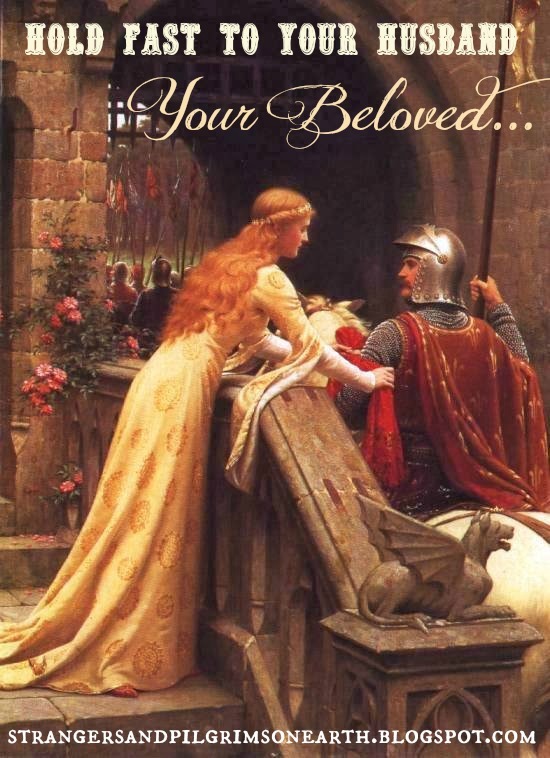 Hold Fast to Your Husband ~ Your "Beloved"
"The way to love anything is to realize that it may be lost." Embrace your husband today, right now if he is home. Let him know you love him, you appreciate him and that you need him. Tell him how important he is in your life. Praise him for his good traits. You don't realize the weight that these words of encouragement hold. Give him the love he needs to be satisfied with you, his family, his lot in this earthly life. May your sweet love bring him back to your welcoming porch every evening. And when he steps out of that door each morning, whisper a strong prayer for him. It is dangerous and rough and tempting out there. There are many needy people in this world that will take what is not theirs. Brand your love on his heart so everyone will know that he belongs to you. "I am my beloved's, and my beloved is mine…"
"One of the problems of her wedded life—is to retain this charm for her husband's eyes as long as she lives, to appear lovely to him even when the color has faded from her cheeks and when the music has gone out of her voice. This is no impossibility; it is only what is done in every true home. But it cannot be done by the arts of the dressmaker, the milliner and the hair-dresser, only the arts of love can do it! The wife who would always hold in her husband's heart the place she held on her wedding day—will never cease striving to be lovely. She will be as careful of her words and acts and her whole bearing toward him—as she was before marriage. She will cultivate in her own life whatever is beautiful, whatever is winning, whatever is graceful. She will scrupulously avoid whatever is offensive or unwomanly. She will look well to her personal appearance; no woman can be careless in her dress, slovenly and untidy—and long keep her place on the throne of her husband's life. She will look well to her inner life. She must have mental attractiveness. She will seek to be clothed in spiritual beauty. Her husband must see in her ever-new loveliness, as the years move on. As the charms of physical beauty may fade in the toils and vicissitudes of life, there must be more and more beauty of soul to shine out to replace the attractions which are lost. It has been said that "the wife should always leave something to be revealed only to her husband, some modest charm, some secret grace, reserved solely for his delight and inspiration, like those flowers which give of their sweetness only to the hand which lovingly gathers them." She should always care more to please him—than any other person in the world. She should prize more highly a compliment from his lips—than from any other human lips. Therefore she should reserve for him the sweetest charms; she should seek to bring ever to him some new surprise of loveliness; she should plan pleasures and delights for him. Instead of not caring how she looks—or whether she is agreeable or not when no one but her husband is present, she should always be at her best for him! Instead of being bright and lovely when there is company, then relapsing into languor and silence when the company is gone—she should seek always to be brightest and loveliest when only he and she sit together in the quiet of the home. Both husband and wife should ever bring their best things to each other!" You may also be interested in reading other Matters on Marriage. I am one of those weird people who enjoy making the mundane tasks into pretty pleasantries. What about you? Here is another way to add "ap-peel" into your daily laundering routine. While I still love our other fabric softener recipe, this one would be the frugal counterpart as it doesn't require the use of essential oils to scent your softener. However, the aroma is just as clean and lovely! Once again, plain white vinegar is the foundational ingredient. It not only softens and deodorizes your clothing but it also helps to remove soap residue from your laundry. The bonus is that vinegar cleans your machine of limescale deposits if you have hard water issues like we do. 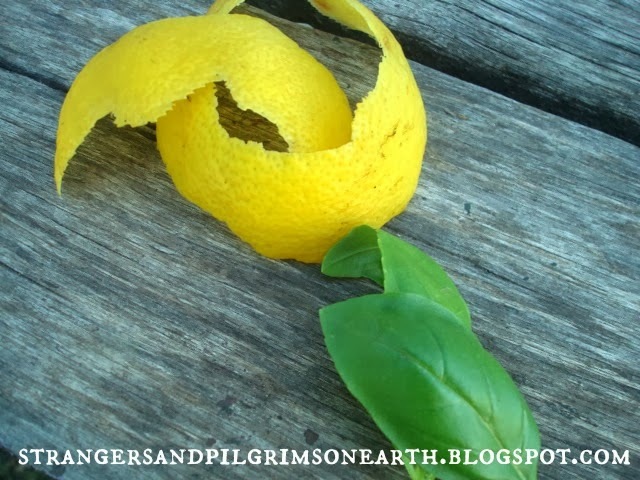 The "romantic" items you will need is a long strip of citrus peel (just the zest, not the white pith) and a fresh sprig of herbs. The zest will add a dose of disinfectant, cleansing and fragrant properties to your wash while the herb will further sweeten the aroma of the softener. Some ideas would be a sprig of lavender, mint or basil. I am planning on trying a few fresh rose petals in my next batch when they bloom. 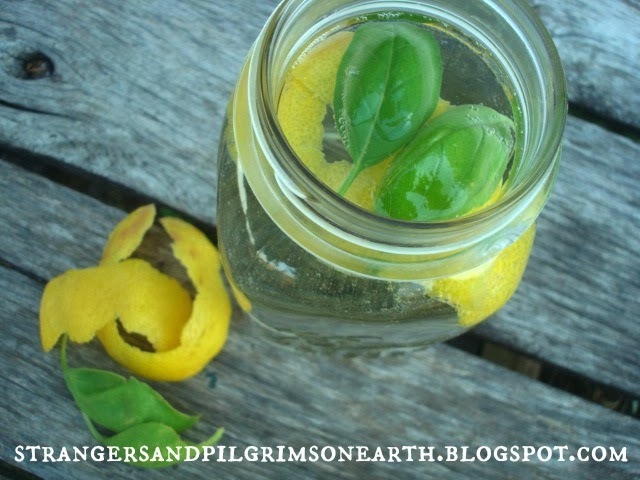 Place your citrus zest ribbon and herbal sprig into a clean jar or glass container. Add one quart of vinegar and let the mixture sit overnight. It is ready to use the following day. 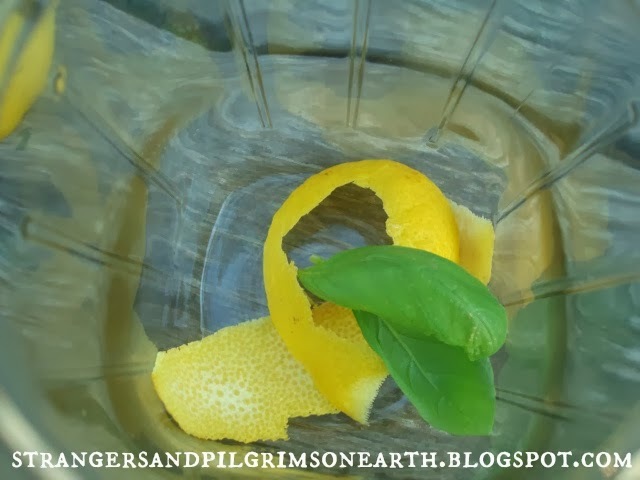 Making a weeks worth of this concoction would be perfect to keep this as a fresh and fun rinse for your laundering needs. Visit here for our printable of fabric softener labels. The citrus ones would be perfect for this project. Add 1/4 cup of your fabric softener to each load on your HE washer and 1/2 cup per load when using a top loader. Warning: Do not mix with bleach in your washer. You may also be interested in a Look Inside Our Laundry Room ~ Printable Laundry Labels, Making Fabric Softener with Essential Oils, Wash Day Prayer Printable, Loving Laundry and Learning for Children and "Work of Our Hands" ~ A Homemaker's Wash Day. "All that day was such a happy time. Laura did her washing and sprinkled and ironed the clean, fresh clothes." An Invitation~ If you are interested in the contents posted on this blog, then I encourage you to subscribe to our articles via email (located on the sidebar) in order to keep you updated. 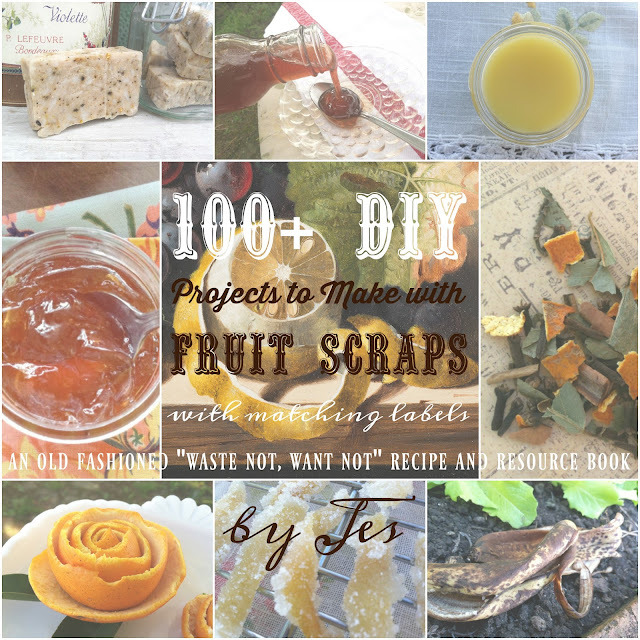 If you enjoyed this project, we share 100+ more ideas on how to use up fruit scraps in our Ebook here! Happy kitchen-crafting, ladies! All the fine print. This post may be shared with some or all of the following link-ups: The Art of Home-Making Mondays, Modest Mom Monday's, Monday's Musings, Make Your Home Sing Monday, Good Morning Mondays, The Scoop, Titus 2 Tuesdays, Tuesdays with a Twist, Raising Homemakers, The Homesteader Hop, Wise Woman Link Up, Homestead Blog Hop, Wow Us Wednesdays, Coffee and Conversation, Homemaking Thursdays, Home Sweet Home, Our Simple Homestead, Awesome Life Friday Link Up, Five Star Frou Frou Friday, and Shabbilicious Friday. Thank you lovely ladies for hosting these. This post may contain affiliate links (which are merchant links that help to support this site at no additional cost to you if you purchase an item through them). This lovely idea was inspired by Gifts from the Garden by Deborah Robertson. 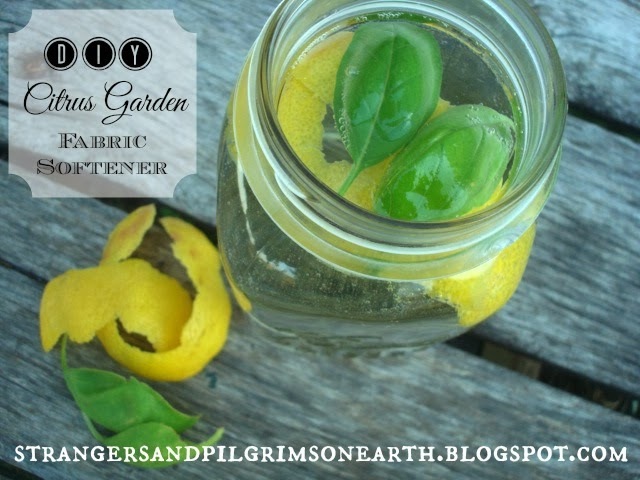 All Natural Citrus Fabric Softener Recipe. How I love this set of books! 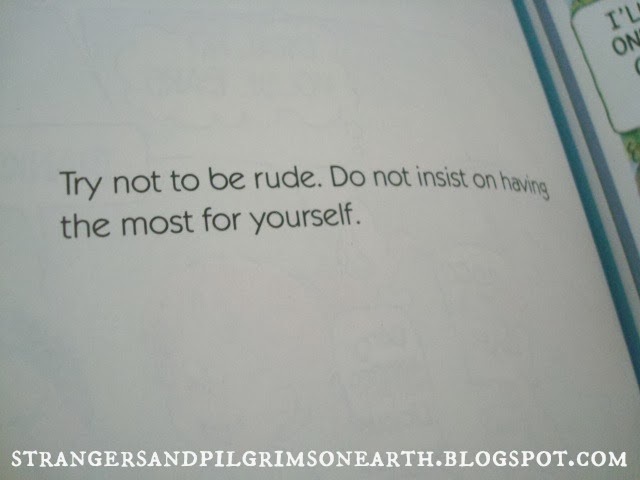 I remember telling my little daughter things like, "don't be rude" in order to correct her character in those younger years. 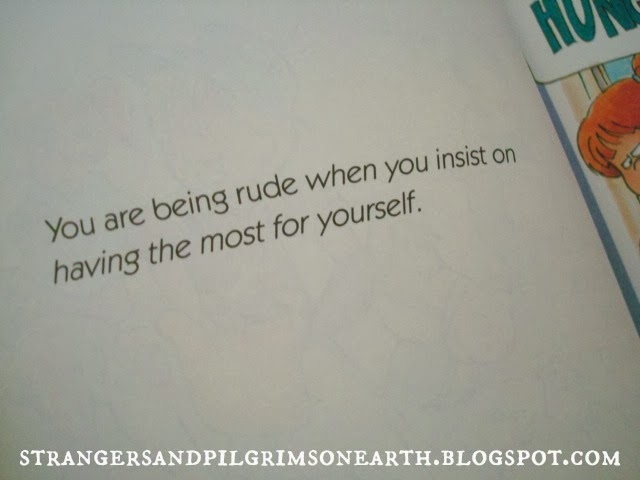 The frustrating part was that she didn't understand what "being rude" meant and I was at a loss. 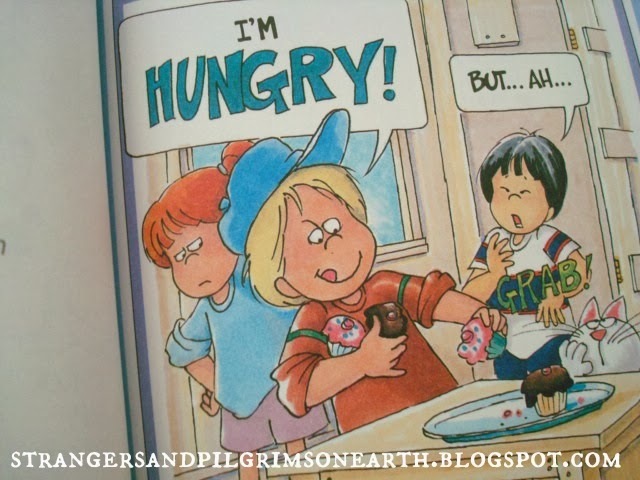 It is a struggle in the beginning to use vocabulary words to discipline your children when they don't comprehend the meaning. 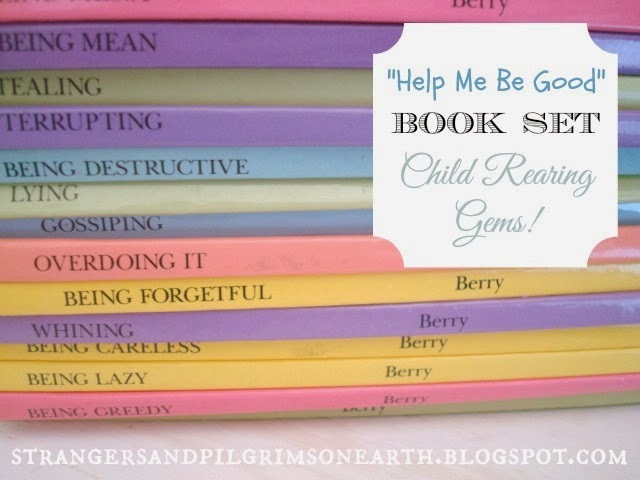 This is where the "Help Me Be Good" books are gems for dear, distraught mother. It is one of my favorite sets that I share with close friends and family and so I thought to share them with you. 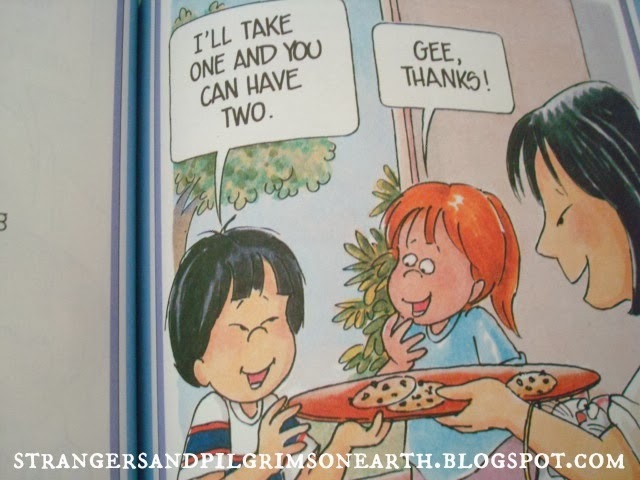 Each book focuses on a character concept to read to your child. They are simple to understand, with plenty of pictures to amuse them which further illustrate the point. The best part is that your youngsters will now recognize what "being greedy" means. They will identify with what "being wasteful" is, "being destructive" and so on. You can confidently correct them in their conduct knowing that they have full understanding. The communication gap has been bridged! 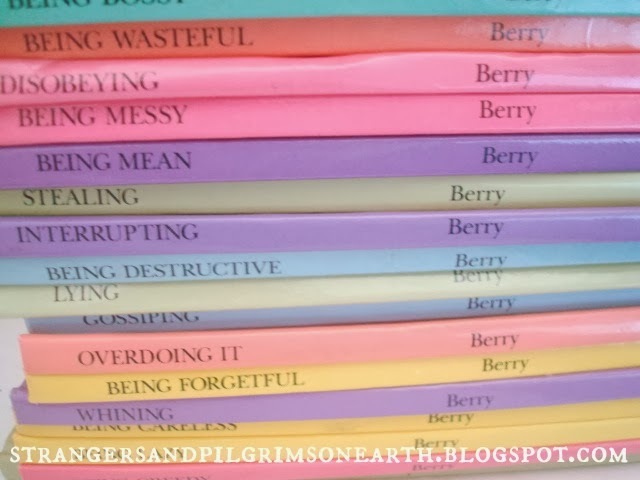 This series were out of print for some time but I recently came across them in paperback boxed sets which includes songs to accompany them. Though I can't vouch for the music CD's, I will definitely recommend the books. They have been such a blessing in our household! 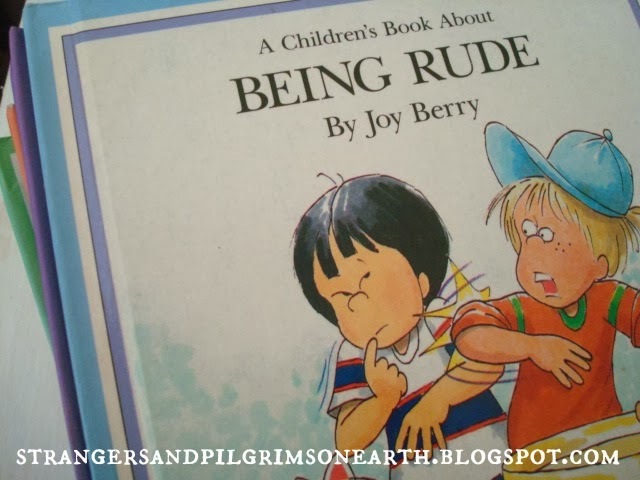 Note: Though these books are not "Christian" in nature, their goal is promoting character building traits that honor God. You could always summarize each book with an appropriate Bible verse to tie everything together. 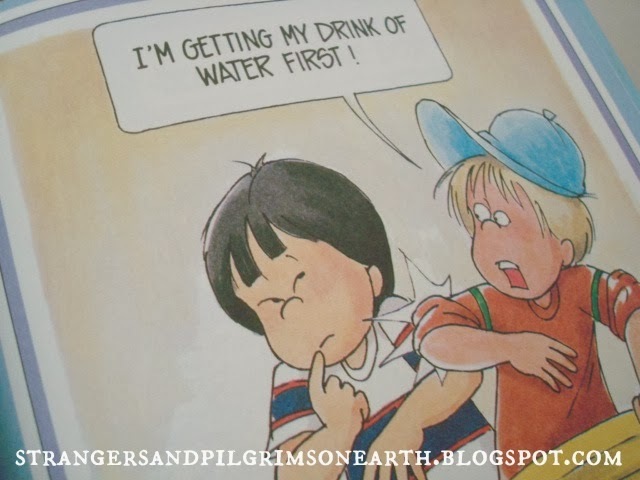 You may also be interested in our Biblically Principled Picture Book List. It gives understanding to the simple." This post may be shared with some or all of the following link-ups: Modest Mom Monday's, Homestead Barn Hop, Teach Me Tuesday, Raising Homemakers, Make Bake Create, Wise Woman Link Up, Christian Homemaking, Wildcrafting Wednesday, Welcome Home Wednesdays, Frugal Days, Sustainable Ways, Homemaking Wednesdays, Homemaking Thursdays, From the Farm Blog Hop, Farmgirl Friday and Clever Chicks Blog Hop. Thank you lovely ladies for hosting these.